Joseph Hill (January 22, 1949 – August 19, 2006) was the lead singer and songwriter for the roots reggae group of teh same name, most famous for their 1977 hit “Two Sevens Clash”, but also well known for their “International Herb” single. Hill recorded twenty-two albums. Joseph Hill was born in Linstead in Saint Catherine Parish in 1949. He was raised in a Christian family and began singing in church at the age of six. Within two years he was making his own musical instruments. After leaving home he came into contact with Rastafarians and adopted the faith. He began his career in the late 1960s as a percussionist, recording with the Studio One house band the Soul Defenders. 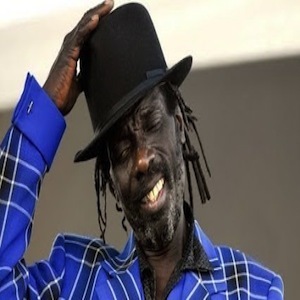 He also worked as a sound system deejay, and began performing as a backing vocalist, leading to his singles “Behold the Land” and “Take Me Girl” in the early 1970s. In the early 70s Hill performed with two groups that included future reggae star Glen Washington – C35 Incorporated and Stepping Stone. He performed regularly on the hotel circuit, but had his greatest success with the group. Hill formed Culture in 1976, and had early success with the prophetic “Two Sevens Clash”, predicting apocalypse on 7 July 1977. During the seventies the group had a string of highly successful singles for producers Joe Gibbs and Sonia Pottinger including the song ‘Two Sevens Clash’ which made its mark on both Jamaica and the United Kingdom. It was named by Rolling Stone magazine in 2002 as one of the ’50 Coolest Records’ – the only single artist reggae album to make the list. The group also had a hit with ‘Stop Fussing and Fighting’, a song that addressed the chaotic political climate of the late 1970s and the attempt on Bob Marley’s life. Joseph Hill and Culture developed a reputation as a performing group after a performance at the ‘One Love Peace Concert’ in 1978, and was soon regularly touring the United States, Europe and Africa. In recent years the group continued to perform at least one hundred concerts each year – with Hill’s wife Pauline performing road manager duties. Hill was a presence on stage – part deejay as he directed his band to reconfigure songs on stage and part teacher as he commented on Jamaican history and current political issues. In his lyrics, Hill often explored how the legacy of slavery continued to have an influence on Jamaican citizens. Yet, what made Culture unique was that Hill always tempered his messages by having a smile on his lips and a dance in his feet. He was never without a good joke at hand. Hill had received a number of honours; an induction into the Jamaican Reggae Walk of Fame and a 2005 Independence Award presented by the Prime Minister of Jamaica. In 2005 hew received the Culture Shock Bronze Medal in recognition of his contribution to Jamaican music. Joseph Hill was a devoted worshipper of His Imperial Majesty Haile Selassie I of Ethiopia as a member of the Rastafari movement. Indeed, Hill’s honorific/nickname, “Keeper of Zion Gate” reflects his vaunted position as one of reggae’s and Rastafari’s greatest voices. Hill died after collapsing following a performance in Berlin on 19 August 2006. At his funeral in September 2006, Hill was eulogized by, amongst others, Jamaican Prime Minister Portia Simpson Miller who recognized his contributions to Jamaican Culture and ambassadorship to the world. His son Kenyatta subsequently took over his role in the group.